In SIMION, the “kinetic energy error” (KE error) refers any deviation in kinetic energy not predicated by conservation of energy, as a particle moves between regions of different potential in a static field. The “KE error” check box in Data Recording requests that the KE error be recorded to the log. A zero value would be perfect, but it is normal to be non-zero, as some error will occur due to numerical error in the field or trajectory calculation. Typically KE error will be much under 1 eV. Increasing the trajectory quality factor (T.Qual) and/or Refine convergence objective typically can reduce KE error. KE error is a rough indication of minimum bounds for error in the calculation. A high KE error indicates possible problems and their magnitude, but a low KE error doesn’t rule out other problems. Caution: KE errors have no meaning when time-changing fields are applied via user program. Other user programs like collision models that add/remove energy from particles may also render this parameter meaningless. 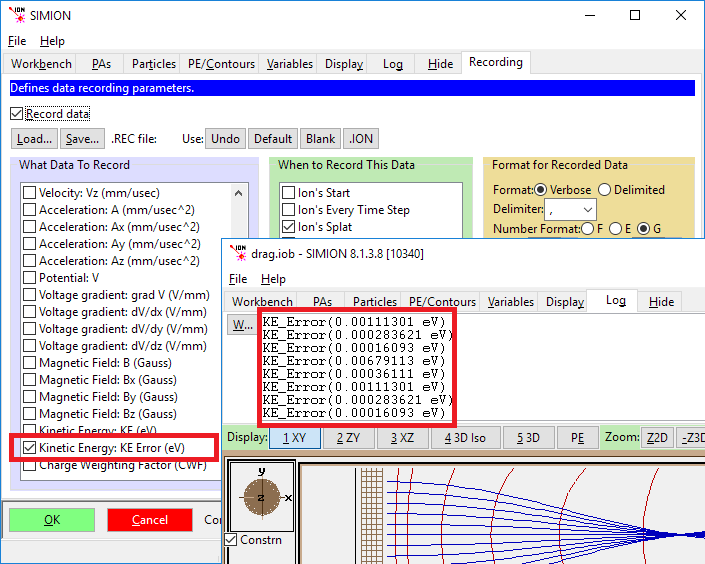 See “KE error” in section 8.6.6 “Selecting What to Record” in the SIMION 8.0/8.1 manual. The technique of flying particles in the reverse direction can provide similar information, where any difference observed graphically between the normal and reverse flown trajectories would suggest a minimum bounds in magnitude of error.